The Brackenwood Patreon continues to grow and real progress is being made on the Last of the Dashkin sequel. 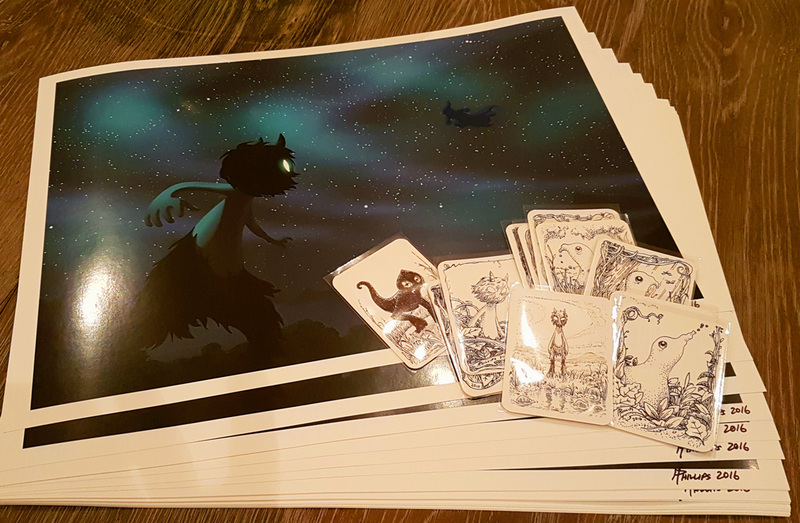 Here are two of the physical rewards I’ve been working on for the Brackenwood patrons. A3 poster of the month – original inks on card in their protective sleeves. The video below is a short time lapse of the card ink process. I’m using metal Hunt nibs and black Parker Quink. Hey Adam! It’s great to see you back in action with Bitey and Brackenwood. I just saw the Patreon page yesterday, and have been debating what level to join at, but seeing these cards gives me my answer. They look amazing! I am super excited to see the progress you make on this. Very exciting to see brackenwood coming back to life! A small request- all your posts on the front page come up with a time signature, not a date signature. Can you amend this? It would help your less frequent visitors see that there is action!